The Fish Can Sing is one of Nobel Prize winner Halldór Laxness’s most beloved novels, a poignant coming-of-age tale marked with his peculiar blend of light irony and dark humor. The orphan Alfgrimur has spent an idyllic childhood sheltered in the simple turf cottage of a generous and eccentric elderly couple. Alfgrimur dreams only of becoming a fisherman like his adoptive grandfather, until he meets Iceland's biggest celebrity. The opera singer Gardar Holm’s international fame is a source of tremendous pride to tiny, insecure Iceland, though no one there has ever heard him sing. A mysterious man who mostly avoids his homeland and repeatedly fails to perform for his adoring countrymen, Gardar takes a particular interest in Alfgrimur’s budding musical talent and urges him to seek out the world beyond the one he knows and loves. But as Alfgrimur discovers that Gardar is not what he seems, he begins to confront the challenge of finding his own path without turning his back on where he came from. 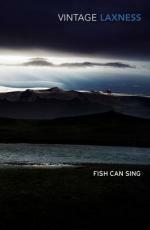 The Fish Can Sing is another amazing work from Halldór Laxness. I have nearly finished all his works currently available in English, and I will be so sad once I am done. I'll have to work hard on improving my Icelandic so I can read the rest! As always, there is a tremendous sense of place, alongside memorable, beautifully formed characters, with that vein of wry humour running through the entire story. A captivating and thought-provoking tale, and, I think, an excellent place to start for those new to Laxness' writing.